President Barack Obama had another uneventful month in the polls last month. I realize that's a pretty dull way to start a column, but we do the best with the data we are given, so to speak. Obama's average approval rate and disapproval rate both got better by the slimmest of margins -- one-tenth of a point -- which places him pretty much where he ended the past two months. His approval rating stayed above his disapproval rating, but by a margin of less than a full percentage point. To liven up this morass of dullness, we are going to quickly run through the numbers here, and then we're going to take a look at what it all might mean in the upcoming election, by doing something we haven't done for a while -- comparing Obama to his predecessors' ratings. April began with Mitt Romney essentially wrapping up the Republican nomination, and the media frenzy surrounding the horserace immediately abated (somewhat). Personally, I got so bored with the situation that I took a break and had some fun with the primary graphs, just to kill time. The political scene was so downright dull that the Supreme Court actually led the news not just once but twice this month, with two important cases that will likely make some waves in June, when the decisions are handed down. The Republican "War On Women" continued, with the Republicans taking a novel "pay no attention to the man behind the curtain" stance on the situation: "War on women? What war on women? You mean all those anti-women laws we're passing? Please, pay no attention whatsoever to that -- it's all the Democrats' fault for refusing to stop bringing up what we're actually legislatively trying to do!" Sigh. It seems the silly season has come early, this year. There were a few minor scandals last month, but neither of them was particularly political in nature, and therefore don't have much bearing on how the public views the president. Internationally, North Korea tried (and failed) to launch a satellite, and the situation with Iran seems to be getting better -- which caused gas prices to stop climbing. Gas is still expensive, but Americans don't seem to be blaming Obama for this situation in the polls (not much, at any rate). The unemployment rate ticked down one-tenth of a percent last month, which didn't hurt Obama (but also didn't help him much, either). President Obama took advantage of the lull in the political world to launch his own re-election campaign, roughly mid-month. This was all reflected in the polling. President Obama chalked up one of the most stable months in day-to-day poll averages ever. In fact, only one month (September of last year) was more stable. Both his daily approval average and his daily disapproval average fluctuated less than two percentage points over the course of the month. This was despite a poll which was wildly worse than all the others in the mix, mid-month (a Fox poll that put Obama's approval at 42 percent, which was criticized by other pollsters for lowballing minorities' opinions). Obama's daily numbers did go below water mid-month as a result, but they largely recovered by the end of the month. Obama's monthly average approval moved up one tiny tick to end the month at 47.8 percent. His monthly disapproval average moved down one tiny tick to end the month at 47.1 percent. While any improvement is good news for the president, the magnitude of the good news is as small as it possibly could be. Which isn't really great news at all. Rather than talk about the overall trends this month (which we could do in one word: "flat"), we're going to instead take a look at the larger political picture Obama faces in the upcoming election. President Obama has a problem which must cause no end of headaches in the White House politics office: he seems to have a built-in "ceiling" of around 49 percent approval. Discounting his first year in office -- when he was still riding the "honeymoon" goodwill -- Obama has posted an approval rating better than 49 percent exactly twice. One of these doesn't even really count, as it was the bounce he got one year ago when Osama Bin Laden was killed. The other time was when he hit 49.4 percent last February. 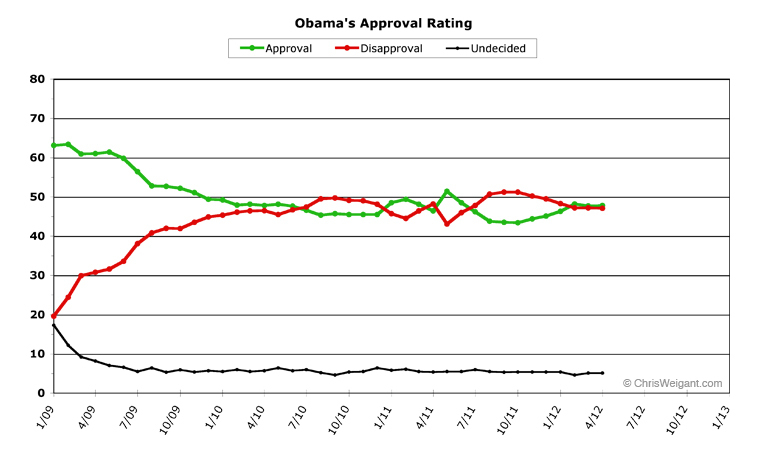 Other than those two instances, Obama has spent the last 27 months below 49 percent approval. Which, as I said, must make the politicos working for him reach for the aspirin, often. Now, job approval ratings are decidedly not the same thing as "Who are you going to vote for?" polling. But it'd be foolish to argue that the two aren't at least related. The worrying thing for Obama's campaign is that the "rule of thumb" for presidential approval ratings is that if you're riding above 50 percent, chances are you'll be re-elected. But this is precisely what Obama has trouble with -- gaining the last two points between 48 and 50. We thought, at this point, it'd be interesting to compare Obama with previous presidents, to see what history has to say about his re-election chances (note: clicking on the following links will show you a comparison graph of Obama and the first term of the president mentioned). Two of the last five presidents were comfortably above 50 percent at this point in their first term, and both went on to be re-elected handily. Ronald Reagan spent nearly a year with just over 40 percent approval, but he had snapped out of this slump and by now was at 54.0 percent approval. Bill Clinton had likewise spent a long stretch in the 40s, but by this point he had a 52.3 percent approval rating. Neither man would slip below 50 percent for the rest of the year, and both won second terms. Two other presidents were in much worse shape. George H.W. Bush had sky-high approval ratings after the Gulf War, but by January of the election year, they had slipped to a disastrous 40.5 percent. This continued until the election, when he only managed 34.0 percent approval in October. Jimmy Carter had a national security "bump" of his own when the Iran hostage crisis hit, but it had crashed back down by this point, when he stood at 39.0 percent approval. 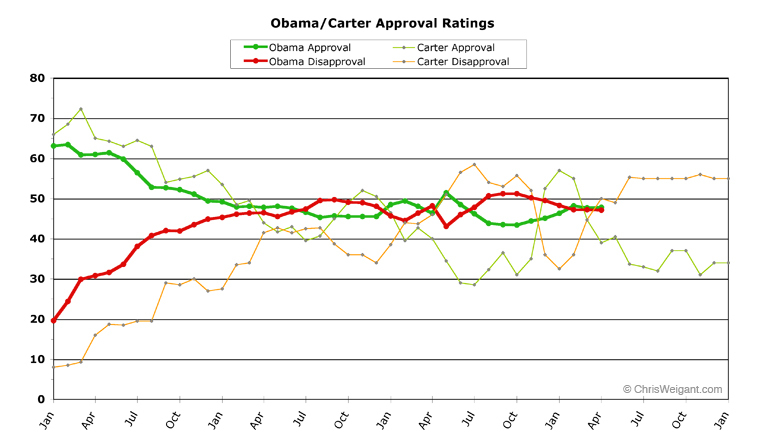 After the next month (at 40.5 percent approval), Carter's numbers would remain in the 30s for the rest of his term. Both men, of course, lost their re-election bid. While George W. Bush also had two national security peaks (9/11 and the invasion of Iraq), both had faded by this point. 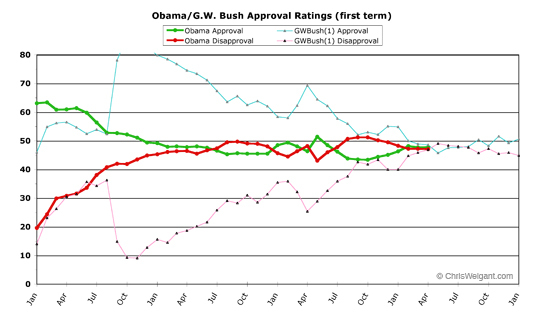 Bush's numbers and Obama's have been almost exactly tracking each other for the past three months. 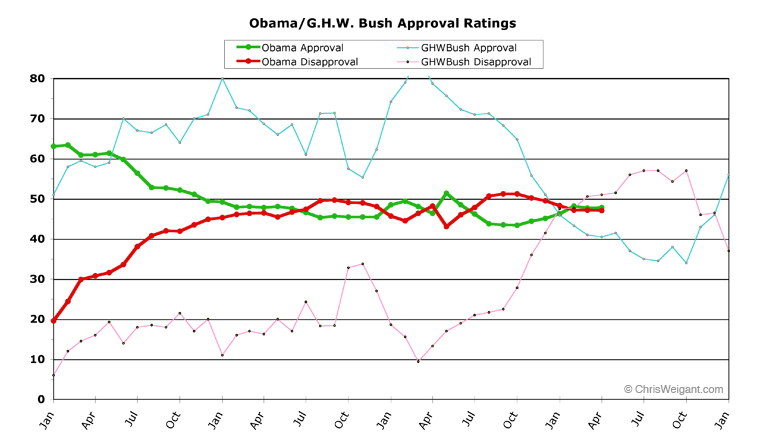 Bush had a 48.6 approval rating at this point, and a 46.9 percent disapproval rating. Both are within one point of where Obama now stands. Bush's numbers stayed pretty flat for the entire election season, until they finally limped over 50 percent and he eked out a win in 2004. 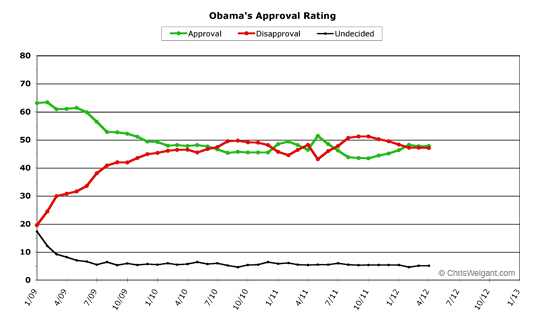 In his second term, his approval numbers fell off a cliff, but that's not really germane to the subject at hand. 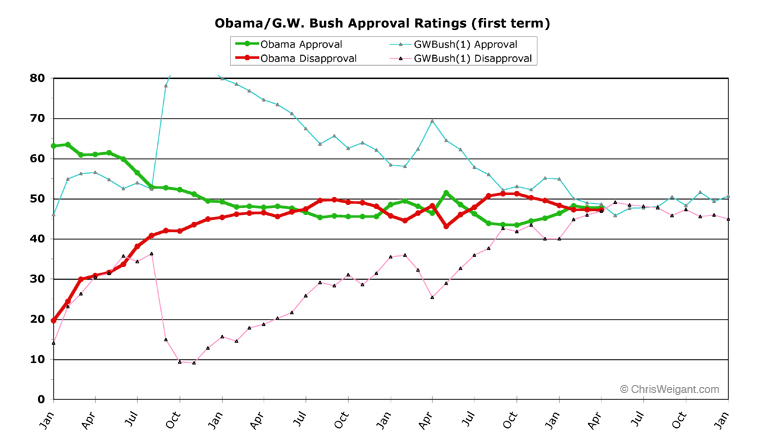 Now, it is impossible to say that Obama will chart the same course Bush did in 2004. The only thing that can be said with any certainty is that the 2012 election will indeed be a close one, no matter what the Electoral College vote winds up being in November. This will be a campaign fought on the tiniest of margins, to put it another way. 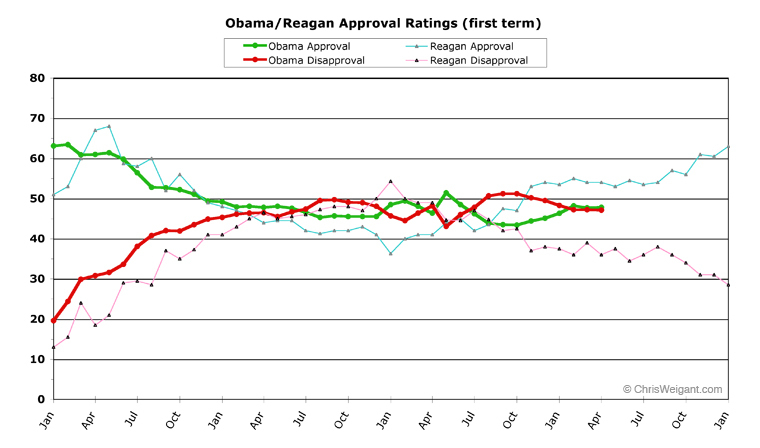 Obama is much weaker politically than Reagan or Clinton was at this point. But he's also a lot stronger politically than Carter or the first Bush. Obama faces a candidate much weaker than he, at least in the current polling, but that is no guarantee of success. If Obama cannot manage to pull his approval up above 50 percent (and keep it there) for the rest of the year, this election could be the nail-biter that some are now predicting. The biggest problem for Obama is that he has absolutely NOTHING good on the horizon..
Arizona V Obama is likely going to go mostly AZ's way.. The Oowsers (rhymes with Lusers) have been trying to resurrect their failed movement in the most violent ways possible..
Holder's going to held in Contempt Of Congress for trying to cover up Fast/Furious. And that light at the end of the tunnel?? Ya know, it's kinda funny..
During the Bush years, many commenters here at CW.com remarked that it was insane that people could be so blindly loyal to President Bush..
"Hi, Kettle.. Nice ta meetcha.."
These are the kinds of stories you are NOT seeing in the Main Stream Media..
Because the Obama Administration has decreed that they not be reported.. This couple WORKED for the local newspaper, fer christ's sake!! And the attack wasn't reported AT ALL... It was only an OpEd piece two weeks after the fact that gives ANY voice to this travesty of "justice". Are we seeing ANY red lines yet?? Ya have to wonder what Obama's poll numbers will look like after this.. I have another nomination for the MDDOTW award.. The bone head commercial writer who thought it would be a good idea to have President Clinton say that things would be REALLY bad *FOR OBAMA* if the Navy Seals had been captured or killed during the attack..
summers have generally not been very kind to president obama's approval ratings. this summer may prove no exception, but he has one thing going for him this year that he hasn't had any other year of his presidency: mitt romney. everybody hates romney, even most of his own party. i mean, even newt gingrich seems downright likeable by comparison. the guy just doesn't seem to care about human beings, and isn't very good at pretending that he does. this is not to say that i'll necessarily vote for obama, but comparison with romney makes him look a whole lot better. You take that into account PLUS all the knocks and lumps coming down the road for Obama?? the same was true of bush in 2004, and romney is a surprisingly similar candidate to kerry. anyhow, romney's deficits don't end at likeability. people also don't trust him, and maybe that's an even bigger issue. then again, lack of enthusiasm for candidates suggests low vote count, which tends to favor republicans. so... i guess we'll see. I would disagree that your average American was "petrified" of another 4 years of Bush. Perhaps your average LEFTist was petrified. But, as has been amply proven under Obama, the Left doesn't have a problem with torture or summary executions or the like. That will be the deciding factor in the coming election..
Barring any major upheaval, courtesy of Israel or Al Qaeda..
respectfully disagree. first off, it was not just lefties who were frightened of another four years of bush. i think the dividing line on that front was IQ more than ideology. although it took much of the general population a little longer than that to figure out how incompetent bush had been in his first four years, intellectuals of either political stripe had already figured out what was happening as a result. i think this election goes exactly like 2004, with a nail-biter decided by a few midwestern states, and obama the likely victor. Not so much due to anything he's done, but due to a weak and generally disliked and mistrusted opponent. The competence of the Bush administration was directly related to the political obstructionism of Democrats..
Like I said, Bush had to fight Democrats harder and more often than he had to fight Al Qaeda. I know that sounds harsh, but no other scenario fits the facts. Bush could have enjoyed better success than Obama if the Democratic Party could have seen past their selfish agenda and did what was right for the country, rather than for their Party. everybody hates romney, even most of his own party. i mean, even newt gingrich seems downright likeable by comparison. the guy just doesn't seem to care about human beings, and isn't very good at pretending that he does. I don't hate Romney. My gut reaction to seeing him in person a couple years ago was pretty much devoid of any hostility. I don't think he has what it takes to be a good president, but he's not a sleazeball like John Edwards or an irresponsible cretin like Dubya. Romney opens up a double digit lead amongst Independents and NPAs.